So while we have all the gladiators covered with their own unique page, its often common to want to see the list as a whole complete unit. So we’ve compiled the list here, with some additional notes and information about the gladiators. The name of the secutor, means ‘chaser’ and this is what this gladiator was supposed to do when fighting their common opponent the retiarius. This gladiator was supposed to represent the god of fire with the retiarius representing the god of the sea. The samnite was one of the earliest gladiators and was based of the defeated men of Samnium who were bested by Rome in battle in the 4th century. Their place in the amphitheatre was a reminder to the Samnites of their loss. The retiariis name translates to ‘net fighter’ and these gladiators were easy to spot with their trident and net that they used to try and ensnare their foe and then stab them. A retiarius and a secutor gladiator class fighting. The gladiatrix were the almost mythical female gladiators of ancient Rome. There are many notes and historic mentions of these brave women, and there was even a rule wrote up explaining how women were not allowed to fight in the amphitheatre at one point in history. The eques gladiator was unique, in that they entered the amphitheatre on horseback! These gladiators would fight with spears until either one was dismounted or they both stepped off horseback to continue the battle on foot. The provocator found only other provocators and their name translated means ‘challenger’. This gladiator style changed subtly over the years, but they often carried lots of armour including breastplates, helmets, manicas and greaves. The murmillo was that typical, quintessential gladiator class, the one that almost everyone think of when envisaging a gladiator. The murmillo wore a heavy bronze helmet, and carried a scutum and gladius. The hoplomachus was the gladiator equivalent of a Roman legionary, with very similar armour and weaponry. These gladiators essentially represented a Roman solider when they might fight a gladiator class from a battle Rome had already won, a was almost of commemorating history. The cruppellarius was the most heavily armoured of all the gladiator classes, and was something akin to a medieval knight. The biggest considered difference is that a cruppellarious did not have metal armour on their hands or their feet, but otherwise it was pretty much all the way metal armour for these heavily protected gladiators. The bestitarii had many meanings in Rome, but typically they were related to animals, and the common meaning is almost for Noxxi gladiators who were forced to try and fight wild animals, or could be applied to animal trainers, or even sometimes used to describe legitimate animal hunters, who were more commonly known as venatores. The andabatea were less gladiator and more comic relief for the Roman crowds. The andabatea were put in the arena with each other, often blinded by a helmet with no eye holes or just one. This lead to what is described as a rather comical affair with multiple andabatea all swinging widely trying to survive with limited or no visibility. A ventore was a hunter, and while not typically a gladiator, there role was still entertainment in the amphitheatre. The ventores would fight all kinds of exotic beasts, and were extremely popular with the Roman crowds. The dimachearus was build for offensive attacks with dual curved swords known as scimitars. These gladiators were something of a mystery, and were not as common or well documented as many of the other gladiator classes. The thraex gladiators represented the thracians, and therefore had quite unique armour and weapons. The thraex was armed with a small parma shield, and a sica blade, which unlike the typical gladius, was a curved blade meant for slicing and cutting. 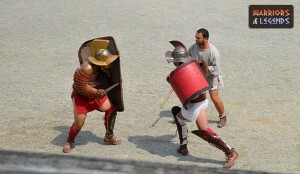 A murmillo fights a thraex gladiator class. The cestus gladiators were the boxers of the Roman amphitheatres, a shared passion with the Greeks, the Roman’s also loved a bit of boxing. 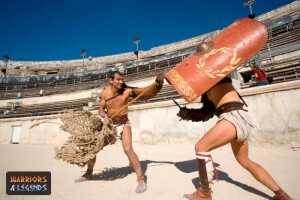 The cestus gladiators typically fought with a variety of gloves, after which they gained their name ‘cestus’. The gloves could be padded with leather to protect the hands, wrapped with iron, or even have metal spikes to further cause damage to their opponents. The essadarius gladiator was typically armed with dual swords, sica blades specifically and although very little is truly known about this gladiator, it’s thought they were almost one hundred percent offensive fighters, rather than heavily armoured defensive gladiators. The laauearius gladiators were very similar to the retiarius in that they had a lasso to try and catch their foes, and then once caught they would use a dagger or a spear to try and end their foe. A parmularius was not a gladiator as such but was the name for any gladiator that used a parma shield. The parma shield was easily identifiable for its small size and was only used by a couple of gladiators. A rudiarius gladiator was one who had earned their freedom in the amphitheatre. they would have been granted free man status with a wooden sword that they needed to carry on them at all times. The sagittarius was a horseback archer whose goal was to pick off noxxi gladiators with their bow and arrow. It was not expected for the noxxi to win, but they were often given various obstacles or cover to try and hide from the sagittarii arrows. Not an individual gladiator as such but a parent class for any gladiator that carried a scutum shield. The scutum was typical Roman soldier equipment and therefore was also popular in the amphitheatre, and there were many gladiators who used this shield. The noxxi were not specifically classed as gladiators, but were prisoners or criminals put in the amphitheatre to fight in special matches. These matches were often hard to impossible for the noxxi to win as they would face off in an animal, chariot(against an essadarius) or against an archer(a sagittarius).